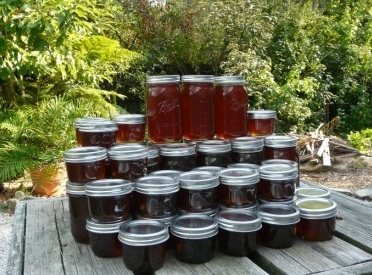 I took two boxes (called “supers”) of honey from our hives. Each super has ten rectangular frames that hang vertically inside the super. 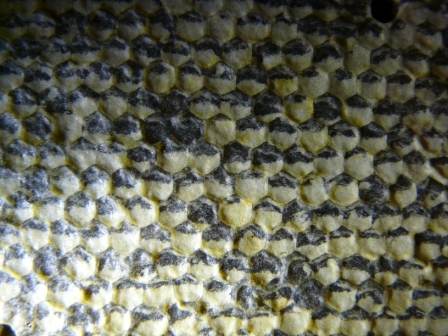 The bees store their honey inside wax cells on each frame. 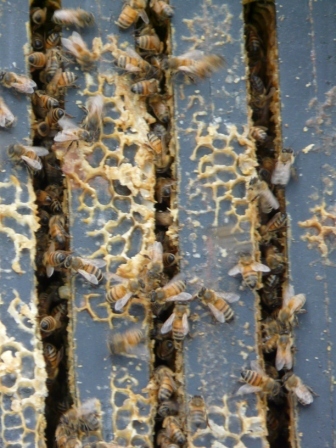 Each hexagonal cell on the frame is full of honey and capped with a thin layer of wax. To get at the honey, I first scratch off the top layer of wax with a sharp fork made specially for the purpose. Some beekeepers prefer to use a hot knife to slice away the top surface. Then I put the frames into a centrifugal extractor. This tall metal cylinder has baskets inside which hold the frames vertically. These baskets are then whirled around at an alarming speed by cranking the handle on the top of the machine. This whirling motion flings the honey out of the frames and onto the inside of the metal cylinder. 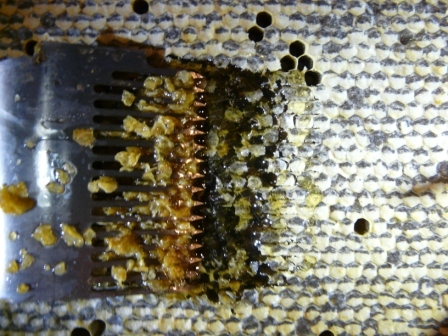 The honey then flows down through a mesh filter into a storage area at the bottom of the cylinder. 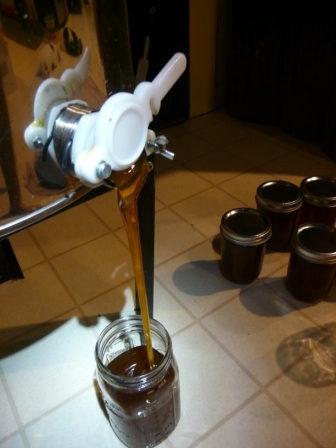 After all the frames have been spun, I pour the honey into glass jars. The two supers had nearly six gallons of honey between them. When I’m finished, I put the equipment and the emptied frames at the bottom of the garden. There, hundreds of bees come out to clean up the left-overs. Within a few hours, no trace of honey remains. I left each hive with one or two supers of honey to keep them happy through the winter. This entry was posted in Apis mellifera, Garden on September 3, 2011 by David George Haskell. When I was a child, my father kept bees in our back yard. Then, I didn’t like honey. Oh what I give now, of course, for that special local flavor. Are you gonna eat all of that honey? Aydin, I think so. We use it to make bread and instead of sugar. Some years the bees produce very little honey, so we also store some up for future years. Honey keeps very well. How exciting. I worked for bee keepers in Phoenix and Tucson and always loved it. 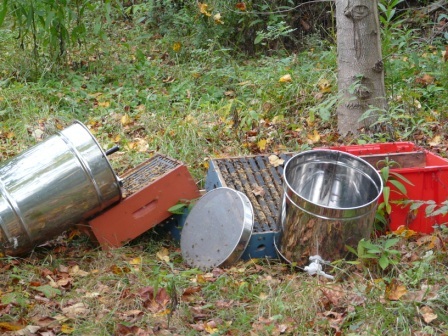 How much honey do you leave the for the winter, and do you plan to have extra to feed them for the winter? Did you buy or build your extractor? I leave one or two supers and I also feed them some sugar water later in the fall (with some essential oils that supposedly drive out the mites…). This is more than the books tell you to do, but I figure that if I were a bee, I’d like a nice full larder for the winter. 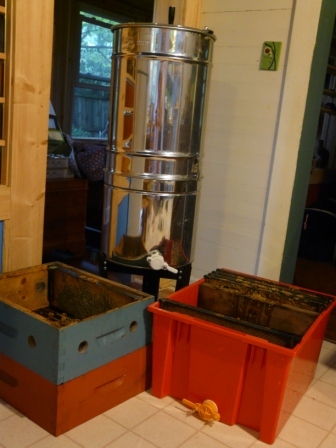 We bought the extractor — it is a mini-version and works OK for relatively small amounts of honey. I remember your tales from AZ — including a sting in the mouth? My husband Rick and I have two colonies and robbed them last week. This was our first year to get honey. We didn’t use foundation, so we cut the comb from the frames and then squeezed it over a 5 gallon bucket with a filter. This can be done on a small scale, but it is messy. We’ll send a jar of our honey to you by way of Callan and you can taste some Georgia honey. Congratulations on your first crop of honey! It is very satisfying to feed on the gathered sweetness of one’s region. I’d love to try a little (perhaps we could swap a jar — I’d hate to deprive you of your hard-earned honey).